WALKSTRONG ~ www.walkstrong.ca: " Courage ... "
For anything important any of us do. Of living with the consequences. Courage, my word. It didn't come. It doesn't matter. Feeling like it was time to re-fuel my soul, I've been watching Tony Robbins on Oprah’s Life class. And it has helped me gain a new perspective around “living with courage”. Living a fearless life really equates living with courage. From the first moment when Tony walked on stage, he exposed the myth of living a fearless life. Tony said, "There's no such thing. Fear is a natural instinct that we are born with. Living fearlessly isn't necessarily accurate. You can't live a totally fearless life, because if you're never afraid, you can't be courageous. To have real courage, you have to be afraid of something." Makes sense right? And we may not realize that we are always stepping outside our comfort zones ... as we experience life changing events. Change is inevitable. So accepting fear instead of ignoring it is the first step as a reminder to embrace and accept that we are human. Now ever think of courage as a muscle? Not me. Yet master life coach Tony Robbins says that “courage is a muscle that has to be strengthened”. We can work this muscle as we set ourselves up for success by working at living a courageous life ... a constant work in progress ... a lifestyle that takes practice. I realized that it is important for me to understand where the fear is coming from first instead of convincing myself that I am not afraid. I need to face my fear head on. That in itself is a scary thought ... afraid to face your fear. But when you do, you can begin to understand where your story originates from. Then you have have the ability to change it, if you have a strategy ... an individual approach to deal with your fear. 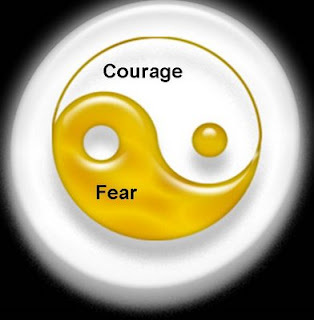 Thanks to Oprah & Tony, I have been re-affirmed to strengthen my courage muscle by continuing to work on my state of mind in my current journey with cancer ... not to just survive but to thrive by continue to take all that powerful fear energy and transform it, redirect it and focus on healing, nurturing, loving and living.